One thing you’ll probably realize when you move is how much stuff you actually have, most of which won’t be able to make the cut for the moving truck—which is great! You now have an opportunity for an epic yard sale on your hands. Yard sales bring people together and get your stuff in the hands of people who’ll make the most of it. Since you probably don’t hold a yard sale every day, it’s likely you’re a little rusty but don’t worry—we’ve got tips and tricks to make sure yours is a triumph. If your place is off the beaten path, consider asking to use a friend or family member’s house that’s in a better, more high-traffic location. Ideally, the location would make it easy for passersby to drop by on a whim (think lots of street parking). It’s definitely “the more, the merrier” when it comes to yard sales. If you can market your sale as a two- or even three-family shindig, you’re almost guaranteed to get more traffic. Plus, when it comes to splitting the work, it’ll be a team effort instead of a solo endeavor. Gone are the days of newspapers being your only advertising option. Post your yard sale info to online places like craigslist and local and community Facebook groups. Aim for a day that isn’t sweltering hot or predicted to be rainy—you want it to be as comfortable as possible for your customers to be outside perusing your stuff. Have a backup plan if you can, like garage access for rain or selling water or lemonade if the day turns out to be a scorcher. When it winds down to the last few hours, you can mark things down drastically and once the sale is over, you can take what didn’t sell and give it a try at a consignment store. Some people just love to haggle—hear them out and consider lowering your price, especially as the day goes on (but don’t drop below your minimum). Your goal, after all, is to get rid of your stuff in one fell, yard-sale-style swoop. You’ve got to get your signs where people will see ‘em—think about branching out to high-traffic locations or spots that are hosting community events during the day or weekend of your sale. Since your shoppers are much more likely to want to pay with plastic instead of cash, invest in something like Square to process payments right from your smartphone or tablet. One thing you want to avoid is overwhelming your customers. Organizing your stuff by category or price point will go a long way to provide a little method to the madness. While it can be tempting to skip the hassle of setting up a display, a thoughtful presentation makes your stuff look more appealing and makes shopping easier for your customers. It’ll save you stress and ward off anxiety for buyers that don’t like to haggle. Check out eBay for going rates and mark prices around 10% of the retail price, but consider adding a 15 to 20% markup above your minimum to leave room for the hagglers. Know the lowest amount you’re willing to accept so you don’t end up feeling like you got taken for a ride when it’s all said and done. Whether it’s old school style or simply an app on your phone, you’ll definitely want to have a calculator available to quickly calculate change and tally up totals. Use up those plastic grocery bags or extra reusable totes you’ve managed to accumulate. You’ll want to stock up before yard sale day to avoid losing sales to people simply because they didn’t come prepared to carry away what they found. Have a power source nearby so you can plug in electronics to show that they work and swing by a dollar store for some cheap batteries beforehand to make sure everything is ready to go. Try starting your sale on a Friday around 6 a.m. to catch commuters on their way to work or kids and their parents on their way to school—especially if you’re selling lots of kid’s items. You’ll end up losing money if you can’t make correct change. Have lots of little bills on hand—you can add little bills up, but you can’t always break big ones down. Having a yard sale Saturday can be a fun family event and an opportunity to teach your kids about money, savings, and all those good skills they’ll thank you for one day. Anything that’s left after your yard sale and a trip to the consignment store is an opportunity to give to those in need. Bonus: donating guarantees that nothing you wanted to sell ends up back in your house as clutter. There you have it, ladies and gentlemen. You’re now armed with all the information you need to have a successful yard sale that will be a fun way to get rid of the stuff that can’t move with you. Just think about all the fun stuff you can do with the extra money, too. 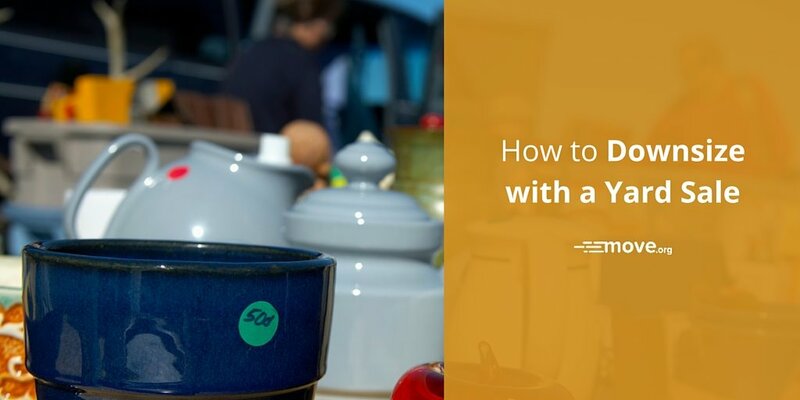 From indulgent adventures during your move to investing in making your new place even better than the last, you won’t regret having that yard sale when you’re figuring out how to spend that cash. Cinnamon is a writer and editor whose work has been featured in FastCo.Exist, GOOD.is, Elite Daily and more. You can read more about her work and current life in Nicaragua with her dog, Gus, at www.cinnamon-janzer.com.